This sounds like a fun family event to benefit a number of great animal groups including SAINTS. 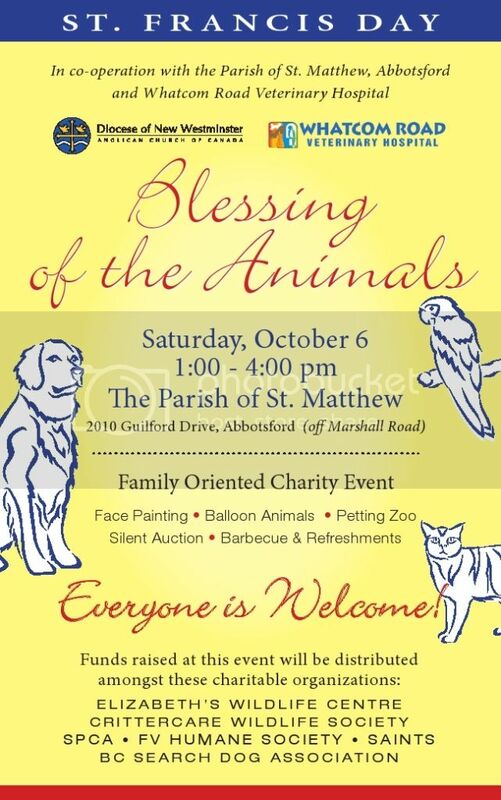 Have your pet blessed Saturday October 6, 2012 at Parish of St. Matthew in Abbotsford – 2010 Guildford Drive. Thanks also to Whatcom Road Veterinary Hospital for helping to coordinate this event. 2 Comments on "Blessing of the Animals"
Whatcom road vet is great, that’s where all my furry babies go. Great News – the Saints Rescue COLLECTOR CARDS are NOW available on the 1000Saints website. There is NO additional fee for postage to any destination in Canada or the Continental USA. The cards are also available directly from Maggie Calloway or from Bunny (Moi). I am on site this Sunday so if you are interested in ordering cards let me know, you can leave your money/cheque on the Board in Ed’s room ATTN: Bunny and I will leave your cards for you to pick up at a future date.